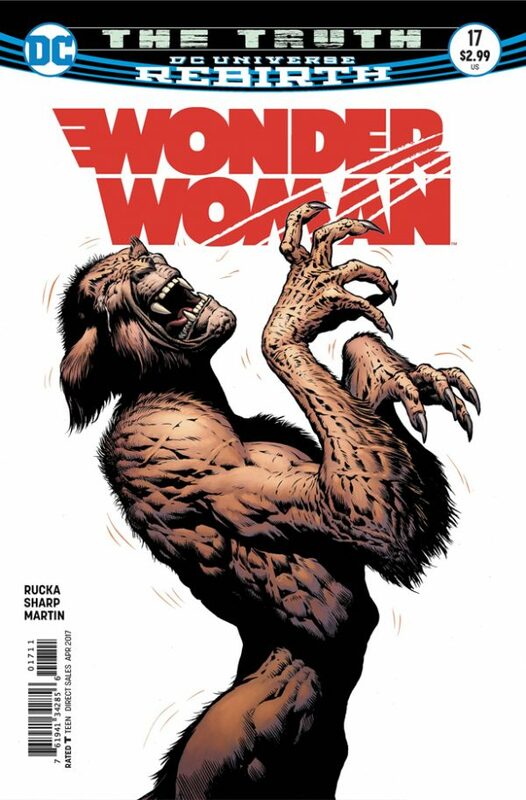 This is the second issue of Greg Rucka’s second present-day storyline (alternating issues with a Year One storyline). Diana is in a mental institution apparently bereft of her powers, having a conversation with herself (perhaps) or some outside entity, gradually gaining clues about her situation. Meanwhile, on Themyscira, Queen Hippolyta and her Amazons stand ready for battle before an ancient gnarled tree, but somehow the battle is not coming. They know something terrible has happened to Diana, but not what. In New York, Steve Trevor and two of Diana’s other friends, one a huge bull-man named Ferdinand, are under assault from enemies of Diana that also have Dr. Barbara Ann Minerva (formerly Cheetah) as their prisoner. Dr. Minerva can save Steve and friends if she agrees to once more become Cheetah, under the control of a new master. A lot going on here, all interesting and beautifully drawn by Liam Sharp. Loving the new work of Greg Rucka on this title. This entry was posted in Comics, Reviews on June 22, 2017 by Todd.